Spin to win at the round table on Excalibur Slots, the 5 reel 20 payline slot game with a free spins round to boost your riches! Journey to the middle ages when you play Excalibur Slots, & win your treasure at King Arthur's round table! 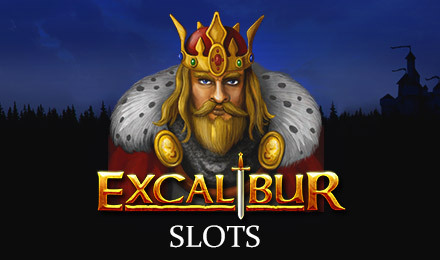 Excalibur Slots is a 5 reel 20 payline video slot machine with bonus games, free spins, scatter and wild multiplier symbols to boost your winnings. This Net Entertainment game includes a skill stop feature, an auto play option and game history access as well. The mythical sword Excalibur is the wild multiplier symbol. When the Excalibur becomes part of a winning combination, winnings are doubled. The Gold Excalibur is the second wild symbol which multiplies your winnings four times when part of a winning combination. Finally, the Gold Chalice is the scatter symbol for this slot game, and when you get at least two Gold Chalices you'll earn free spins. If you're extra lucky, you can get up to 30 free spins with this scatter! Best of all, any winnings from the Free Spins Bonus Round are multiplied by three, which means you can win up to an extra thirty free spins! So come play Excalibur Slots, and win triple your treasure at the round table!